Public Participation - water, environmental, United States, impact, industrial, world, sources, use, health, Who Is thePublicin Public Participation?, What DoesParticipationMean? Public participation is the general term for diverse formal processes by which public concerns, needs, and values are incorporated in governmental decisions. Public participation involves the use of techniques such as public meetings and hearings, advisory committees, interactive workshops, interviews, questionnaires, focus groups, and other methods to identify public concerns and preferences and address them during decision making. It does not include nonformal means of public involvement ranging from lobbying to letter campaigns and protests. Most recent federal laws authorizing or establishing federal programs, including the latest environmental laws, contain requirements that agencies consult with the public during the design and implementation of the program. If money is given to the states, then these public participation requirements are also passed on to the states. Who Is the "Public" in Public Participation? Public participation does not mean taking a vote. The agencies offer the opportunity to participate, and people choose whether or not to participate. Because participation is self-selecting, most people who participate are those who have a "stake" in the issue (hence the term stakeholders ). They may be affected economically, they may already use or want to use a resource (i.e., land or water), they may live in close proximity to a proposed project (and could be impacted by dust, noise, or traffic), or they may have a legal mandate that would be influenced by a project (i.e., a local government or regulatory agency). Often, the stake that people have in a decision primarily involves political philosophies or values. Because public participation typically involves only those who have a stake in the decision, some agencies have begun to use the term stakeholder involvement instead of the term public participation. The public that is involved in public participation processes changes from issue to issue. People who are deeply concerned about environmental issues may not be involved in education issues, or decisions about welfare programs. People who live near a project may be very concerned about that project, but have little interest in similar issues elsewhere. Despite these limitations, if some level of agreement (or at least acceptance) of a decision can be reached among the people who care most deeply, the agency has a stronger political mandate to act. Implementation of the decision is far less likely to be delayed by lawsuits or continued political opposition. One of the problems with public participation is that it is sometimes easier to inspire the participation of a small group of people who would be affected negatively, whereas it is difficult to motivate the participation of a much larger group who might benefit from a project, but not so greatly that it inspires them to participate. Some people use the term public participation when what they really mean is providing information to the public. Every good public participation program involves disseminating complete and objective information to the public, so people can participate on an informed basis. But public information alone is one-way communication. Public participation requires two-way communication. Sometimes, the term public participation is used to describe a process whereby the public has a formal opportunity to comment on a proposed action, just before an agency announces its decision. The agency may or may not change any part of its decision in response to public input. It must conduct a "scoping process," typically a public meeting, to discuss the scope of the study. Hold a public hearing after a draft version of the EIS has been distributed to the public. Announce a public comment period (usually thirty days) with the agency providing a response to each comment in a final environmental report. But if an issue is controversial, procedural public participation alone rarely resolves the issue. It is true that people may have been "heard," but when an agency goes ahead with a decision, that decision may still remain sufficiently controversial that it will never be implemented. That is why, beginning in the 1980s, some agencies began to move beyond minimal procedural requirements to public participation that is characterized by genuine consultation or collaboration between the agency and the public, in an effort to address as many of the public's concerns as possible. The agency still makes the decision, but typically it does so by endorsing a solution that addresses as many of the public's concerns as the agency can, within the confines of its legal authorities, regulations, and budget. If there is still a minority who oppose the action, there has been enough interaction that the minority understands the decision-making process was fair and open, and why the decision was reached. There are reasons why it is important that agencies retain this final decision-making authority. First, "the public" that participates on a particular issue consists of those people who choose to participate, not the entire public. A project that may have many undesirable impacts on a local community may benefit the country as a whole, and government agencies have to consider the broader state or national interest as well. Agencies operate within legal mandates, that is, authorities and budgets that constrain their options. Sometimes, this means they cannot implement options promoted by an advocacy group that fall outside their legal authority and would require the agency to violate legal requirements or far exceed their budget. Finally, the issue may be controversial not because of what the agency wants, but because the public itself is bitterly divided over the issue. Sometimes, even this consultative approach to public participation will not result in sufficient agreement that an agency is able to make a decision which will ever be implemented. Opponents may throw up legal or political barriers that block any action. In recent years, agencies have experimented with a number of techniques, including mediation, arbitration, negotiated rule making, and interest-based negotiation to resolve such issues. These techniques are sometimes referred to as dispute resolution or alternative dispute resolution techniques, because they are frequently used as an alternative to litigation. Each of these techniques has proven to have value in special circumstances. Why Should the Public Be Involved in "Technical" Decisions? Many decisions that agencies think are "technical" involve choices between more than one thing society thinks is good. For example, when a regulatory agency sets a standard, such as air pollution standards, these standards can only be achieved by installing very expensive equipment, and sometimes only by shutting down existing factories, putting people out of work. The agency finds itself having to decide which is more important: clean air or jobs. If an agency creates a regulation prohibiting smoking in public buildings, it is making a choice about the relative importance of public health compared with freedom of choice. Both health and freedom of choice are good; the question is what weight or importance should be given to one over the other in a particular circumstance. Many government agencies must make these kinds of value choices, and legislation alone does not provide sufficient guidance to determine what choice should be made in a particular decision. Although these decisions need to be informed with technical information, there is nothing about technical training that makes experts more qualified than the public in deciding which values are most important for society. Agencies need to consult with the public on these important value choices. From the 1930s onward, the size of the U.S. federal government grew very rapidly, and government became involved in making many decisions that affected people's lives. As government grew, decisions previously made in a political process were increasingly delegated to technical experts. Over time, many people began to feel that impersonal bureaucrats were making decisions which controlled their lives. After the Depression and World War II, there was broad general agreement in the United States that economic development should be the primary objective of domestic national policy. Leaving decisions to the experts worked well so long as this broad social consensus existed. But in the 1960s, that consensus began to dissipate. The civil rights movement challenged the existing system of segregation, and when the public saw nightly images on television of African-Americans being brutalized by the police during nonviolent marches or demonstrations, and the aftermath of church bombings and other racially motivated violence, the social consensus began to change. Riots in Watts, a low-income area in Los Angeles, and the riots that spread throughout major cities following the assassination of the Rev. Martin Luther King Jr., caused many government officials to believe that the country was in serious trouble and the old ways needed to be reconsidered. It was during this same time of turmoil and reflection that the environmental movement also began to grow. Many environmentalists questioned the belief that economic development should always be the primary goal. The environmental movement learned much from the civil rights movement and adopted a form of grassroots activism that challenged the existing political system. Natural resource agencies always seen as "the good guys" found themselves under increasing attack. The controversy over the Vietnam War also challenged basic beliefs about America and its role in the world. The ensuing Watergate scandal during President Richard M. Nixon's first term, and other revelations concerning political corruption and dishonesty, further engendered public mistrust of government. The "leave it to the experts" mentality was effectively challenged on all fronts. 1946 Administrative Procedures Act Established minimum standards for participation in agency rule making, including public notice, opportunity for group representation during trial-like hearings (adjudications), maintenance of a public record during such hearings, and holding public hearings (at the agency's discretion) on other matters. 1964 Economic Opportunity Act ("War on Poverty") Required "maximum feasible participation" of the poor in decisions about community action programs. Agencies were obligated to encourage involvement of "target" populations. 1966 Demonstration Cities and Metropolitan Development Act ("Model Cities") Required widespread participation among those affected by its program grants. 1966 Freedom of Information Act Provided public access to most documents of government agencies. 1969 National Environmental Policy Act Established the Council on Environmental Quality (CEQ), required intergovernmental consultation, and provided funding for citizen groups. 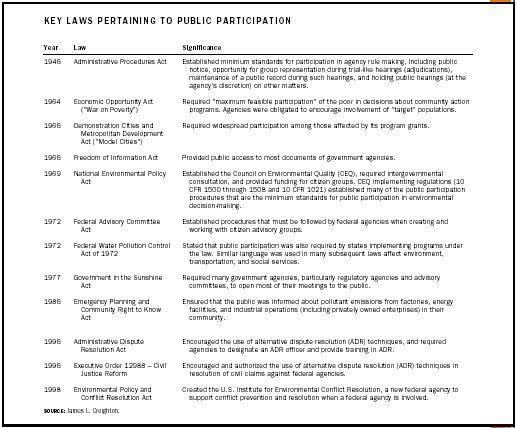 CEQ implementing regulations (10 CFR 1500 through 1508 and 10 CFR 1021) established many of the public participation procedures that are the minimum standards for public participation in environmental decision-making. 1972 Federal Advisory Committee Act Established procedures that must be followed by federal agencies when creating and working with citizen advisory groups. 1972 Federal Water Pollution Control Act of 1972 Stated that public participation was also required by states implementing programs under the law. Similar language was used in many subsequent laws affect environment, transportation, and social services. 1977 Government in the Sunshine Act Required many government agencies, particularly regulatory agencies and advisory committees, to open most of their meetings to the public. 1986 Emergency Planning and Community Right to Know Act Ensured that the public was informed about pollutant emissions from factories, energy facilities, and industrial operations (including privately owned enterprises) in their community. 1996 Administrative Dispute Resolution Act Encouraged the use of alternative dispute resolution (ADR) techniques, and required agencies to designate an ADR officer and provide training in ADR. 1996 Executive Order 12988 – Civil Justice Reform Encouraged and authorized the use of alternative dispute resolution (ADR) techniques in resolution of civil claims against federal agencies. 1998 Environmental Policy and Conflict Resolution Act Created the U.S. Institute for Environmental Conflict Resolution, a new federal agency to support conflict prevention and resolution when a federal agency is involved. many agencies have issued policies and regulations concerning public participation that have created additional requirements. Public participation has now developed sufficiently that many agencies require their planners and decision makers to attend public participation training. Public participation has also become a professional specialty. The International Association for Public Participation (IAP2) was established in 1992 and as of 2002 has approximately one thousand members. Some of these members define themselves as public participation practitioners, and provide these services on a full-time basis within agencies, or as consultants. Many of IAP2's members, however, are planners, engineers, or program managers who see public participation as an important tool for being effective in those professions. In 1998 Congress created a new federal agency to promote and support processes to prevent and resolve conflict when a federal agency is involved. The U.S. Institute for Environmental Conflict Resolution is housed within the Udall Foundation in Tucson, Arizona. Like any new field, the public participation field faces many challenges. Environmental activists and business leaders tend to be both white and middle class. Racial and ethnic minorities are underrepresented in many public participation processes. Language and cultural differences may account for some of the underrepresentation. But other barriers include a general fear of government agencies (who were sometimes sources of outright oppression in immigrants' countries of origin) and the belief that participation will not necessarily change the outcome. The Internet provides a powerful new tool for participation, although all its potential uses are still being discovered. In the near future, agencies will not only use the Internet to provide information to the public, but almost all information repositories (places where copies of government documents are stored and made available to the public) are likely to become "virtual." Increasingly, the Internet is being explored as a tool for gathering public input and information. There is considerable concern, however, about a "digital divide," as the number of people with access to the Internet in the African-American, Latin, and Native American communities, and the poor in general, is considerably lower than in the public at large. People fear that the heavy use of the Internet by agencies will mean that minorities and the poor will not have the same access to the decision-making process as those people who are connected digitally. Activist groups, on the other hand, have embraced the Internet enthusiastically, and use it extensively for organizing and communication with other groups across the country. Some developers and business have filed so-called strategic litigation against public participation (SLAPP) suits against citizen activists whose involvement in the decision-making processes may have caused delays or blocked issuance of building or environmental permits. Often, SLAPP suits have little basis in the law, but activists must hire lawyers to defend themselves in such actions, frequently at great personal expense. Many private individuals are unable to afford this, even if they would win ultimately, whereas large companies usually have the resources to hire attorneys and keep the process going as a threat against future participation. Several state courts have rejected SLAPP suits summarily, and this may begin to curtail their use. SEE ALSO A CTIVISM ; A GENCIES, R EGULATORY ; A RBITRATION ; C ITIZEN S UITS ; C ONSENSUS B UILDING ; E NVIRONMENTAL I MPACT S TATEMENT ; E NVIRONMENTAL J USTICE ; G OVERNMENT ; M EDIATION ; N ATIONAL E NVIRONMENTAL P OLICY A CT (NEPA) ; N ONGOVERNMENTAL O RGANIZATIONS ; P OLITICS ; P UBLIC P OLICY D ECISION M AKING ; R EGULATORY N EGOTIATION ; R IGHT TO K NOW ; W ARREN C OUNTY, N ORTH C AROLINA . Advisory Commission on Intergovernmental Relations. (1979). Citizen Participation in the American Federal System. Washington, D.C..
Carpenter, Susan L., and Kennedy, W.J.D. (2001). Managing Public Disputes. New York: John Wiley & Sons. Creighton, James L. (1981). Involving Citizens in Community Decision Making. Washington, D.C.: National Civic League. Gray, Barbara. (1989). Collaborating. San Francisco, CA: Jossey-Bass Publishers. Herrman, Margaret S., ed. (1994). Resolving Conflict. Washington, D.C.: International City/County Management Association. Langton, Stuart, ed. (1978). Citizen Participation in America. Lexington, MA: Lexington Books. Susskind, Lawrence; McKearnan, Sarah; and Thomas-Larmer, Jennifer, eds. (1999). The Consensus Building Handbook. Thousand Oaks, CA: Sage Publications. Thomas, John Clayton. (1995). Public Participation in Public Decisions. San Francisco, CA: Jossey-Bass Publishers. Creighton, James L. (1999). How to Design a Public Participation Program. Washington, D.C.: U.S. Department of Energy. Available from http://www.e.doe/ftlink/public . Creighton, James L.; Delli Priscoli, Jerome; and Dunning, C. Mark, et al., eds. (1998). Public Involvement and Dispute Resolution, Vols. 1 and 2. Alexandria, VA: Institute for Water Resources. Available from http://www.iwr.usace.army.mil/iwr/products . International Association for Public Participation (IAP2) Web site. Available from http://www.iap2.org .